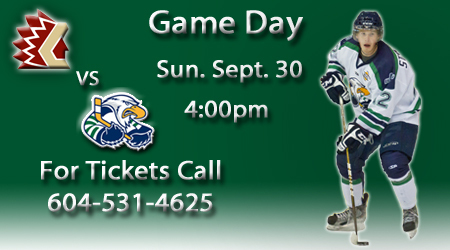 The Surrey Eagles and Chilliwack Chiefs will face each other for the third time in the month of September this afternoon at the South Surrey Arena. The teams split their first two match-ups as the Eagles won 3-2 in overtime on September 14th. Drew Best had the winning goal for the Birds. The following night, the Chiefs got a measure of revenge with a 4-2 win at Prospera Centre. Surrey is coming off a tight 2-1 victory over the Coquitlam Express on Friday evening in which goaltender Michael Santaguida shone, making 30 saves in his first BCHL start. The Birds have yet to win two games in a row this season and will look to buck that trend today. Trevor Cameron will serve the third and final game of his suspension. He'll be eligible to return on Friday against Prince George. Surrey sits in third in the Mainland Division heading into today's action with a record of 4-3-0-0. The Chiefs are also coming off a win after they defeated the Powell River Kings 3-0 on Friday. Austin Plevy, who is committed to Merrimack, leads Chilliwack with seven points in six games. Net minder Mitch Gillam has also had a strong start to the year with a 1.81 goals-against-average and a .953 save percentage. The Chiefs are currently in last place in the Mainland Division. They're 3-2-0-1. After today's game, the Eagles will host another Sunday Skate. Bring your skates and sticks out to the rink and join the boys on the ice following the game at around 6:45pm.